Did you know that scallops are effing expensive as hell? Geez man, $19.99 per pound for these beauties. Is it worth it? I’d say so. I mean, I definitely don’t eat them every week, or even every month. Shoot, honestly, I can’t remember the last time that I had scallops – it must have been at least a year ago! With that said, it’s nice to splurge a little every now and then, and send your money to the sea gods. I got the inspiration for this dish from googling what the heck to do with Champagne Grapes. Melissa’s Produce had sent me some of these beauties – I had never seen them before, and I saw a dish from Epicurious – Pan-Seared Scallops with Champagne Grapes. I thought it sounded pretty good, so I gave it a whirl. They are beautifully soft, sweet, crunchy and delicious!! P.S. Don’t forget – there’s still time to enter Melissa’s The Great Pepper Cookbook (Oxmoor House) giveaway! Follow the link to find out how to enter – the giveaway ends September 8th! Thoroughly dry scallops on both sides, and season with salt and pepper. Melt butter in a saucepan over medium-high heat, and let brown a bit, about 1 minute. Add in the scallops and cook 3 minutes per side. Remove to a platter, and cover with foil. Add in the onions, and cook for about 5 minutes, until softened. Add in the champagne grapes, and cook for 5 minutes more. Add in the wine to deglaze the pan, scraping any bits off the bottom with a wooden spoon. Let the wine reduce to about half. Add in half of the parsley, and all of the almonds, and toss. Divide the grape mixture among four plates, and top with two scallops each. Garnish the plates with the remaining parsley, and serve immediately! If you don’t have champagne grapes, you can use regular red grapes, just chop them in quarters! Totally obsessed with scallops but I can’t remember the last time that I made some! Definitely inspired to go out and make this recipe now.. thanks for the idea! 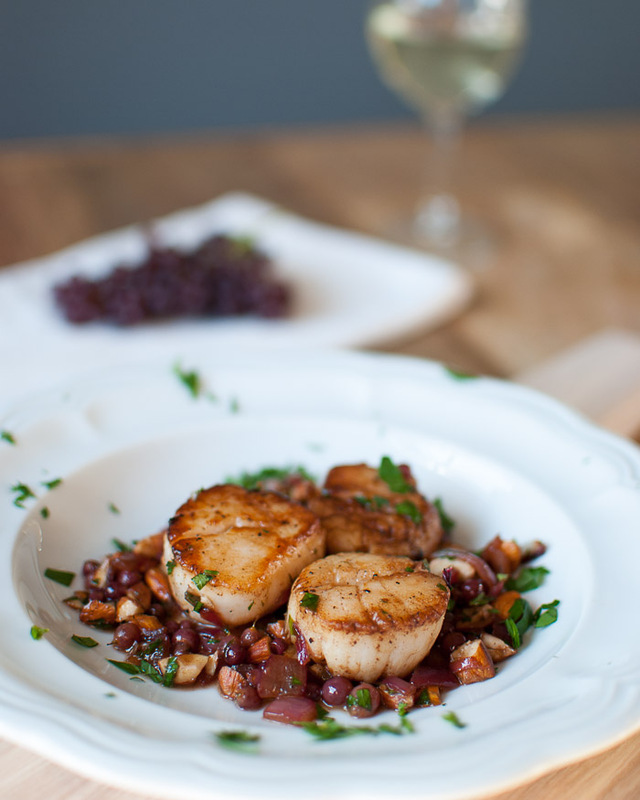 I love scallops, and I wouldn’t thought of pairing them with grapes. Looks wonderful. I can’t wait to try this recipe. Oh wow! I haven’t had scallops in such a long time, probably from the buffet at the Rio. This looks so good.